Jamie Redknapp has named Liverpool defender Virgil van Dijk as his pick for PFA Player of the Year this season. Despite the fine form of last season’s winner Mohamed Salah, as well as various Manchester City stars, Redknapp believes Van Dijk stands out for the huge impact he’s made at Liverpool since joining the club from Southampton last season. And in his column for the Daily Mail, Redknapp also talked up Arsenal midfielder Matteo Guendouzi as one of three contenders for the young player prize. The 19-year-old has been a revelation for the Gunners ever since joining from Lorient, where he played in French football’s second tier last season. Guendouzi has been quite a find for Arsenal and Redknapp lists him alongside West Ham’s Declan Rice and Bournemouth’s David Brooks as among the main contenders to be named the Premier League’s best youngster. That would be some small consolation for Arsenal this season as it looks likely to be another disappointing campaign at the Emirates Stadium. 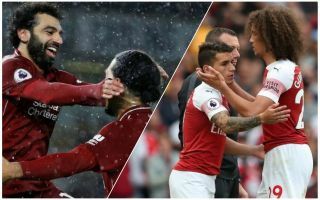 Finishing in the top four now looks a tall order for Unai Emery, but fans can at least comfort themselves that in Guendouzi and Lucas Torreira they have two of the top young midfielders in Europe. ‘No one comes close to Virgil van Dijk. He has transformed Liverpool into a rock-solid team who are favourites to win their first league title for 29 years,’ Redknapp said of Liverpool’s Van Dijk.